The Department of Antiquities, Ministry of Transport, Communications and Works, announces the opening of the exhibition entitled “Ancient Kition and the modern world of Larnaka”. The event will take place on Wednesday, the 20th of April 2016, at 6:30 pm, at the Visitors’ Centre of the Archaeological Site of Kition. The exhibition will remain open to the public until the 31st August 2016. 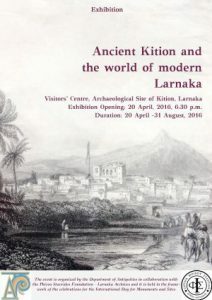 The exhibition includes works of artists who are inspired by old engravings portraying the Larnaka area, particularly the area of ancient Kition, and intervene artistically to produce a modern perspective. It is organized in collaboration with the Phivos Stavrides Foundation – Larnaka Archives and it is held in the framework of the celebrations for the International Day for Monuments and Sites (18 April). The opening of the exhibition is held under the auspices of the Minister of Transport, Communications and Works, Mr Marios Demetriades. At the event, the Director of the Phivos Stavrides Foundation – Larnaka Archives, Mr Iosif Hadjikyriakos will give a short presentation. A reception will follow. If you have any questions, queries or comments about our real estate, visa Services and financial arrangments in Cyprus and Greece, then please get in touch and we’ll be happy to discuss with you. Call us on 01522 519 197, or drop us an email at stav@melkava.co.uk, or fill this form.